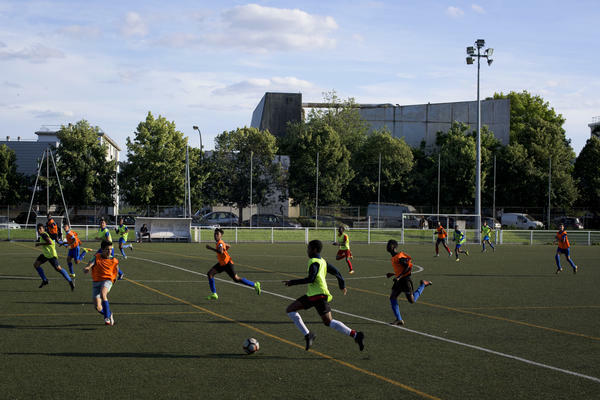 Young soccer players practice at the Sarcelles A.A.S. 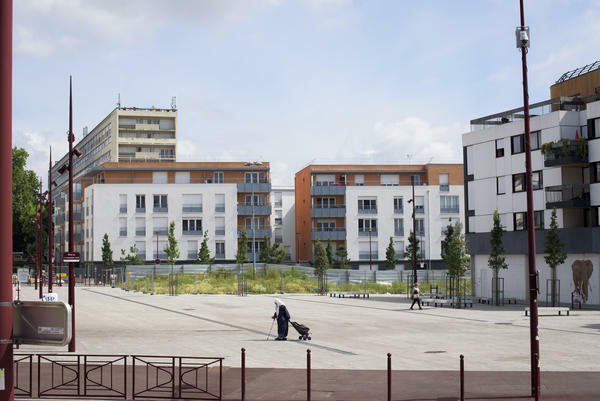 complex in Sarcelles, France. 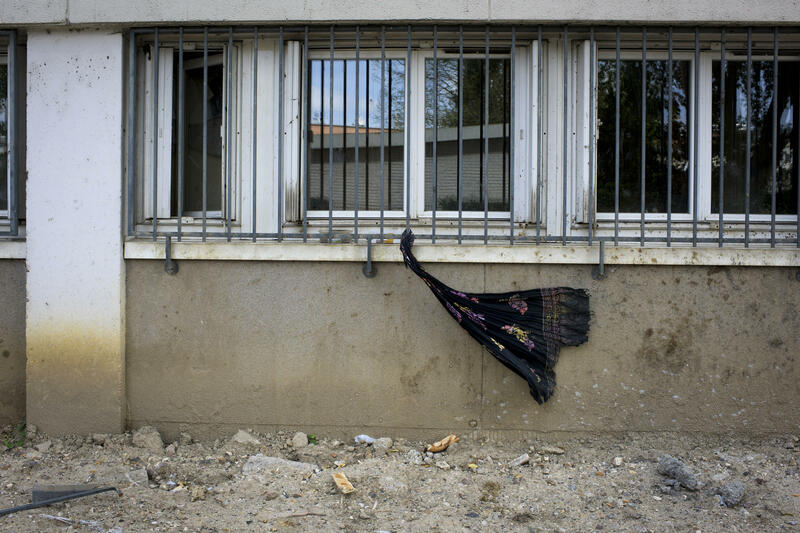 Wind blows a scarf tied to bars on the windows of a housing project in Bondy, France. Old public housing blocks in Bondy are being torn down and replaced by attractive, smaller housing units. Mohamed Coulibaly, watches France's World Cup match against Peru at the Sarcelles A.A.S. complex on June 21. Coulibaly is the director of the soccer program at the club. A woman walks through a square as an old housing project looms behind newer buildings in Bondy, a suburb of Paris, France. 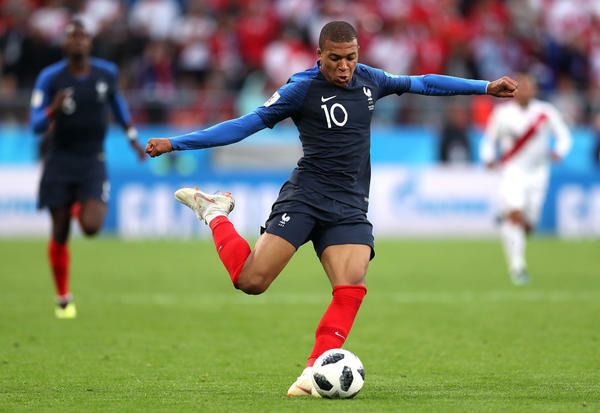 France's forward Kylian Mbappe plays during the Russia 2018 World Cup Group C match between France and Australia at the Kazan Arena on June 16. Mayor of Bondy Sylvine Thomassin stands in her office. She says the "Kylian Mbappe effect" is a real boost for the town. 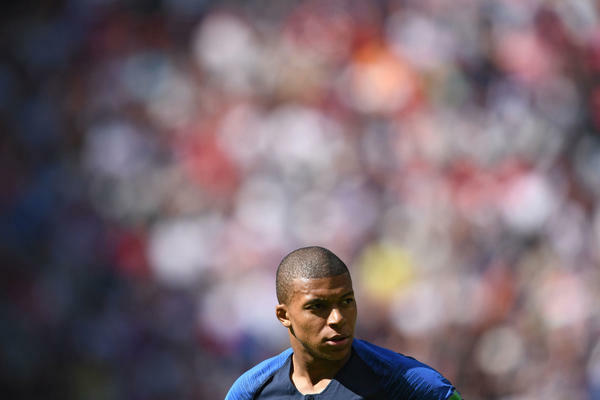 Kylian Mbappe plays during the 2018 World Cup match between France and Peru at Ekaterinburg Arena on Thursday. He scored the winning goal in the 1-0 match. Young athletes at Sarcelles A.A.S. watch France defeat Peru 1-0. France's lone goal was scored by Kylian Mbappe. One of the French team's stars, Kylian Mbappe, hails from the Paris suburb of Bondy. It's less than 10 miles from the beautiful center of Paris but feels like another world with its monolithic, cinderblock buildings. Bondy's mayor, Sylvine Thomassin, says the "Kylian Mbappe effect" is a real boost for the town. "It's marvelous, because so often people talk about the suburbs in negative terms," she says. Thomassin says the Mbappes are an old Bondy family, going back three generations, but originally from Algeria and Cameroon. Starting in the late 1950s and '60s, immigrant workers — mostly from North Africa — flocked to France for the economic boom years. They worked in construction jobs and lived in suburban housing projects around the big cities. But today the jobs have dried up and the housing is crumbling. Many people living in the suburbs say they face discrimination not only over their Arabic and African origins, but also over their postal code. In a parking lot next to one of the public housing blocks, Nordine Beta and a group of friends are listening to French rap music on a car stereo. Beta says it doesn't matter if Mbappe is from here, he refuses to support the French team. "My parents are Algerian and I was born here. But I don't feel French," he says, "because my whole life people have asked me where I'm from. That means I'm still not accepted as French. I shouldn't have to justify myself." Beta says he won't root for the French team because of the way some of its Arab players have been treated. "The media doesn't give the same respect to Arab players, " he says. "And politicians say Arab players should be thankful for what France has given them," he says in disgust. "Nobody ever says a white player should be thankful for what France has given him." Saco Fodié walks by. He's not part of Beta's group. He says it's great what soccer is doing for the suburbs. "We are not seen in a positive light," he says. "It's known the schools aren't so good and a being from the banlieue can be synonymous with being a delinquent." Twenty years ago, France won the World Cup with a racially mixed team — the famous "Black, Blanc, Beur" (referring to Arabs of North African descent) that was hailed as the harmonious future of the country. But a few years, later riots broke out in suburbs across the country over police racism. The hope turned to anger and despair. Successive governments' promises to fix the suburbs have largely gone unfulfilled. But many suburbs are now tackling their own problems. In Bondy, old public housing blocks are being torn down and replaced by attractive, smaller housing units. Mayor Thomassin says there's an energy in the diverse suburbs that's missing from staid, traditional France. "Our suburbs are overflowing with talent and motivation," she says. "But most of France doesn't realize this yet. There is a whole other world on the other side of the Paris beltway." At a soccer club in the neighboring suburb of Sarcelles, a group of kids sings the Marseillaise along with the TV as France gets ready to play Peru. Mohamed Coulibaly is the athletic director of the soccer club where they're watching the game. More than a thousand kids of all ages play here. "The French team has many players from the suburbs, so we are very much a part of this national venture," he says. Coulibaly says kids come from all backgrounds. But they feel completely French. "We're looking at the fifth generation now," he says. "Maybe there were identity issues with the second generation but now they are completely absorbed in this country and proud to be French." In more recent years, the suburbs have become known as hotbeds for radical extremism. Many of the Paris terrorist attackers grew up in the suburbs. But Marie-Pauline Mosango doesn't go in for any of that victim narrative. She's originally from The Congo, but moved here as a girl and lives in the suburb of Villiers Le Bel. "It's false what they say about the suburbs — that they're isolated and people don't have the same opportunities," she says. "A lot depends on how parents bring up their kids." She should know, she's brought up nine kids. "One of my sons, who is 19 now, just got his technical baccalaureate and is working as a mechanic," she says. "It wasn't easy, but I was always behind him." Mosango says she never felt abandoned. "Whenever there were problems with my kids at school someone would call me and there would be a conference and my child would be able to have a school psychiatrist or some kind of help." The Paris suburbs have drawn the attention of soccer recruiters in recent years and several players from clubs here now play professionally in France and internationally. Mickael Nadé played in the Sarcelles and has gone pro. He plays for French professional team Saint-Etienne. Nadé's parents are from Ivory Coast, but he says he feels very French. "I don't forget my origins, but I'm completely French." He says Sarcelles and the suburbs around Paris are great. "We accept everyone," he says. "People know that and that's why they come." Sarcelles is known for its large Muslim and Jewish communities. James Koumpate has come out to watch his son's team practice at the Sarcelles Soccer Club. "With soccer there's no question about race or religion," he says. "We all play together. It's always been like that but now everyone is looking because a lot of French players from the suburbs are succeeding internationally." Koumpate doesn't think the suburbs are disadvantaged either. He says the suburbs are rising, and not just in soccer. "It might be a little harder to succeed in the suburbs because people have less," he says. "But there's more energy and sheer will." Koumpate agrees with the mayor of Bondy that the future of France is playing out here, in its suburbs. In France, there is pride in its national soccer team and high hopes of winning the World Cup tournament now being played in Russia. 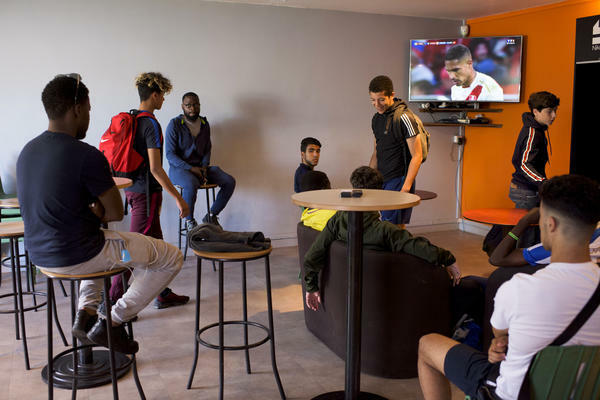 Many players on the French team are from these diverse, big-city suburbs that are struggling with poverty and low expectations. NPR's Eleanor Beardsley visited one of those French suburbs and watched a game with residents. She sends us this report. ELEANOR BEARDSLEY, BYLINE: One of the French team's star players, Kylian Mbappe, hails from the Paris suburb of Bondy. Bondy is less than 10 miles from the beautiful center of Paris, but it feels like another world with its monolithic, cinder-block buildings. BEARDSLEY: Mayor Sylvine Thomassin greets me at the Bondy town hall. She says the Kylian Mbappe effect is a real boost for the town. BEARDSLEY: "It's marvelous," she says, "because so often, people talk about the suburbs in negative terms." Thomassin says the Mbappes are an old Bondy family, three generations, originally from Algeria and Cameroon. Starting in the 1960s, immigrant workers, mostly from North Africa, flocked to France for the economic boom years. They worked in construction jobs and lived in suburbs around big cities\ like Paris, Lyon and Marseille. But today, the jobs have dried up, and the housing is crumbling. Many people living in the suburbs say they face discrimination not only over their Arabic origins but also over their zip code. BEARDSLEY: A group of guys is listening to rap music in a public housing parking lot. UNIDENTIFIED RAPPER: (Rapping in French). BEARDSLEY: Forty-two-year-old Nordine Breta says it doesn't matter if Mbappe is from here. He refuses to support the French team. NORDINE BRETA: (Through interpreter) My parents are Algerian, and I was born here. But I don't feel French because my whole life, people have asked me where I'm from. That means I'm still not accepted as French. I'm sick of justifying myself. UNIDENTIFIED ANNOUNCER #1: (Speaking in French). UNIDENTIFIED ANNOUNCER #2: (Speaking in French). BEARDSLEY: Twenty years ago, France won the World Cup with a racially mixed team that was hailed as the harmonious future of the country. But a few years later, riots broke out in the suburbs over police racism. The hope turned to anger and despair. Successive governments' promises to fix the suburbs have largely gone unfulfilled, but many suburbs are now tackling their own problems. BEARDSLEY: In Bondy, old public housing blocks are being torn down and replaced by attractive, smaller housing units. Mayor Thomassin says there's an energy in the diverse suburbs that's missing from staid traditional France. BEARDSLEY: "Our suburbs are overflowing with talent and motivation," she says. "But most of France doesn't realize this yet. There's a whole world on the other side of the Paris Beltway." BEARDSLEY: A group of kids sings the Marseillaise along with the TV as France sets to play Peru. Mohamed Coulibaly is the athletic director of the soccer club where they're watching the game. MOHAMED COULIBALY: (Through interpreter) The French team has many players from the suburbs, so we're very much a part of this national adventure. Kids here are all different backgrounds, but I can assure you they all feel totally French. BEARDSLEY: Thirty-nine-year-old James Koumpate has come out to watch his son's team practice at the club. He says the suburbs are rising and not just in soccer. JAMES KOUMPATE: (Through interpreter) It might be a little harder to succeed in the suburbs because people have less, but there's more energy and sheer will. BEARDSLEY: Koumpate agrees with the mayor of Bondy that the future of France is playing out here in its suburbs. Eleanor Beardsley, NPR News. Bondy, France. Transcript provided by NPR, Copyright NPR.